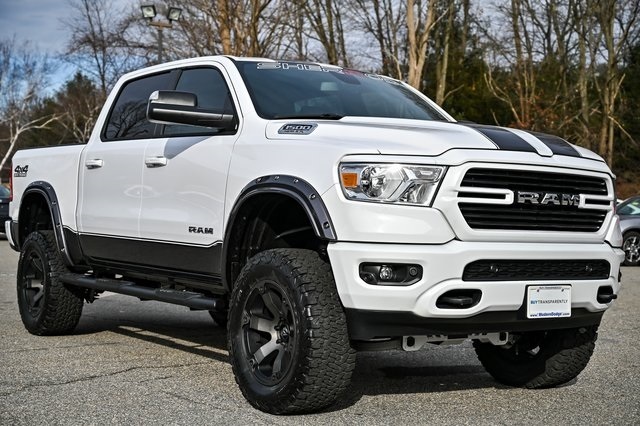 Modern Dodge Ram and Sherrod Custom Vans are proud to offer this one-off brand new 2019 Ram 1500 Big Horn. In addition to standard features like Level 2 group and Navigation this truck also comes with the 3.92 rear axle ratio and the Off Road Group. After that Sherrod added a full 6″ High Country lift with paint matched cross member and a skid plate, 36 x 12.5″ tires on customer 20″ wheels and upgraded exhaust. Sherrod then went above with hand stitched leather seating for all seats, hand painted stripes down the length of the truck and on the rockers as well as side steps. Various parts of the interior were also painted to match the seats. Must see in person to appreciate the detail! Custom orders are also available. Be sure to visit Modern Dodge RAM in Thomaston to speak with one of our Product Specialists. Modern Dodge Ram and Sherrod Custom Vans are proud to offer this one-off brand new 2019 Ram 1500 Big Horn. In addition to standard features like Level 2 group and Navigation this truck also comes with the 3.92 rear axle ratio and the Off Road Group. After that Sherrod added a full 6" High Country lift with paint matched cross member and a skid plate, 36 x 12.5" tires on customer 20" wheels and upgraded exhaust. Sherrod then went above with hand stitched leather seating for all seats, hand painted stripes down the length of the truck and on the rockers as well as side steps. Various parts of the interior were also painted to match the seats. Must see in person to appreciate the detail!